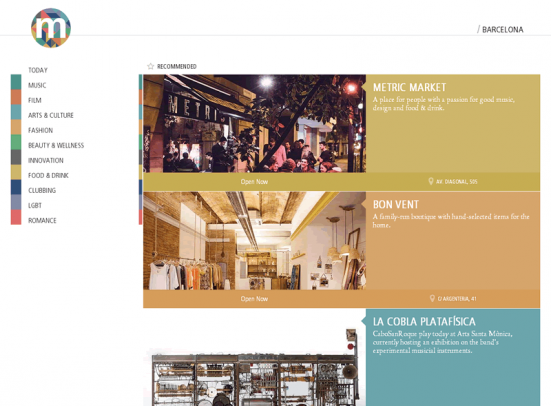 In case you hadn’t noticed Miniguide, in my opinion the best what’s on guide in Barcelona, has a new website. And this time a new app too! I know a website redesign with such a lot of content can be a nightmare project so I caught up with Michael of Miniguide to ask him how it’s all gone. So, the new Miniguide is finally here! Has it been a painful process? Have you achieved what you set out to do? Finally! It’s taken longer than I expected, even though I took that into account (Hofstadter’s Law). So that’s just the nature of making something. I wanted us to build a simple, clear way to give people recommendations on things to do – events and places – that we could update every day. And we have accomplished that using our own technology, not something evil like WordPress. We still have a mountain to climb, but it’s a good feeling. And people seem to like and use what we’ve created, which is all that matters. I really like the simple design and colour scheme. Did this come from you or did you have a designer onboard? Anyone you’d like to mention? Thanks! Our art director is Victoria Walker. You can see more of Vicky’s work on the project on her Behance portfolio. I also worked through many ideas with our previous art director Ana Seixas, who since left the city, as well as the graphic designer Caro Conejo. I put together wireframes with the guidance of UX designer Javier Cuello. On the technical side, Patrick Heneise is responsible for all our development (including backend, API, etc.). Adriana Côrtes and Sonny Piers handled the front end web work. I even did some work on the front end of the app – I’m not so blond after all. And you’ve been advising on the SEO. Maybe one day we’ll rank as high as H2BCN! The site seems to focus much more on what is happening on a particular day. To be more relevant in an always connected world. Are we still going to see the print magazine around town? But digital allows us to do more, most importantly update every day. Part of me wants to kill the print mag, but it’s all tempered by what’s best for our readers and advertisers. Print and digital are complementary. We’ll see how things evolve. Why did you feel you needed a separate app when the website is mobile-friendly already? Why should someone download the app rather than just look at the website on their smartphone? I used to think we didn’t need an app if we have a mobile-friendly (responsive) website, as we do. But I realized that using an app can be “better” than using a website. I always use the Google Maps app for example; I hate using the Google Maps website on a mobile. An app can do a lot of things better than a website – like show places around you (geolocation) or work when you’re not connected to the Internet (caching). Keep in mind our app is still in its early stages. What does the future hold for Miniguide? Do you have anything happening in the coming year you’d like to share? It may sound simple, but our focus is just on publishing great, non-touristy recommendations – events and places – every day. We plan on adding features like favorites, search and a map view. We’ll also be adding “tomorrow,” “this week,” “this weekend,” etc. But for now, there’s no tomorrow. That philosophy works in Barcelona. So, there you have it! Straight from the horse’s mouth. If you haven’t already do check out the new website and let me know what you think in the comments below. And give the app a go too. It’s available for both iOS and Android and it will only get better I’m sure. Yes! Great work, Michael and team. New site’s looking better than ever and, of course, so too is the content. Indeed the heart and soul (not to mention the eyes and the ears) are you guys, the writers.